Herk-de-Stad, Belgium — SCIA Engineer 18.1 — the new release of SCIA’s structural analysis and design software — extends the functionalities presented in version 18.0, taking the multi-material design and BIM integration to a next level. SCIA Engineer 18.1 expands the array of possibilities for economical and clearly documented design of concrete, steel and composite structures. The new version offers an accurate calculation of long-term deflections of slabs with ribs. The implementation of recommendations from SCI publications results in the capability for checking composite beams with multiple openings and a better calculation of the vibrations. Thanks to this new option, users realize an economical and time-effective design of steel-concrete floor systems. The SIA 262:2013 module includes now the possibility to design the reinforcement in beams and columns, allowing users to design concrete structures faster and more effectively. While IFC 2×3 is the standard in Open BIM, the new IFC4 version of this versatile data exchange format attracts more and more attention. SCIA Engineer 18.1 can now directly import IFC4 files generated in other BIM software, broadening and streamlining the cooperation with other software. SCIA is part of the globally operating Nemetschek Group, which places open interoperability at the heart of its strategy. 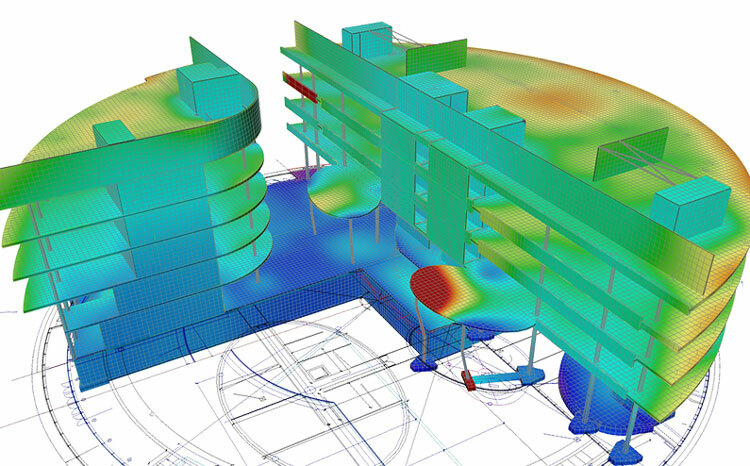 The evaluation of the obtained results is a crucial phase in structural design. The new post-processing environment in SCIA Engineer 18.1 provides engineers with a wider range of more detailed results, allowing them to quickly review and evaluate the results of the numerical analysis. This enables users to decide more easily and faster on further design steps.